records 1080p30 to Compact Flash cards using existing Canon XF 50Mbps 4:2:2 MPEG2 codec. At Paramount Studios in Hollywood today, Canon USA is announcing two forthcoming digital cinema cameras, the EOS C300 and the EOS C300 PL, as part of their new Professional HD Cinema System, which is being branded as Cinema EOS. The two cameras are identical to each other in every way, with the sole exception of the lens mount. 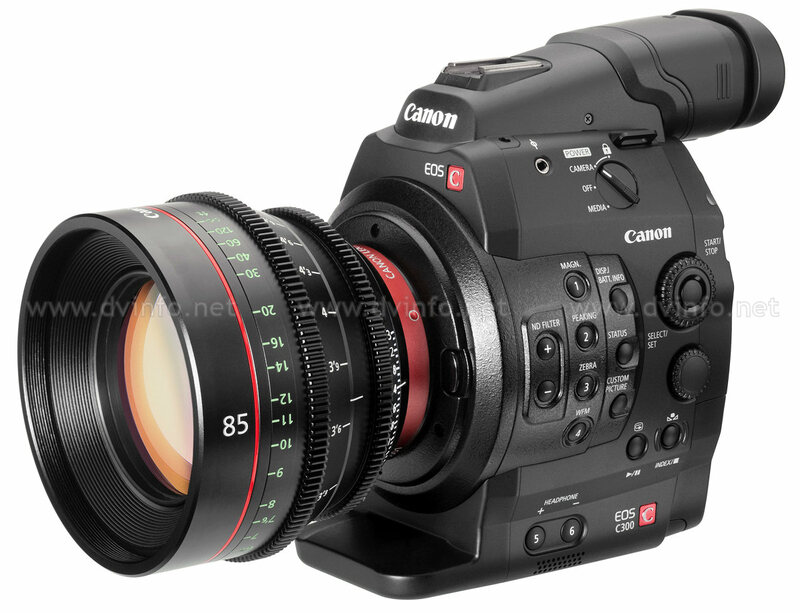 The C300 has an EF mount supporting Canon’s own extensive line of still photography lenses, while the C300 PL has the popular Arri “Positive Lock” PL mount, making it compatible with a broad range of third-party PL-mount lenses as well as Canon’s own line of PL-mount cinema prime and zoom lenses. Note: As far as this article is concerned, in order to greatly simplify things, the two Canon cameras will be referred to singularly as the C300 model. Since the only difference between the C300 and the C300 PL is the lens mount, and everything else within both cameras being completely identical, I will assume that the reader understands that the context of what follows below applies equally to both models… with the exception of certain instances which mention PL lenses or EF lenses in particular. It should be fairly easy to follow along, considering that the only physical difference between the two cameras is the EF lens mount vs. the PL lens mount. Canon sent out its invitations to today’s event back in mid-September. This caused a flurry of speculation about the hardware that was suspected to be revealed. Many good guesses and a lot of wishful thinking went back and forth among DVi members, with the most notable speculation revolving around the idea that Canon would attempt to compete directly against the $5,000 Panasonic AVCCAM AG-AF100 and the similarly priced Sony NXCAM NEX-FS100. But such is not the case. Instead, Canon appears to be targeting the Sony Cinealta PMW-F3 — in price, and to a degree, in feature set. The direct comparison to the Sony PMW-F3 cannot be missed, certainly in terms of price point. The Sony F3 carries an MSRP of $16,800 (with authorized dealers dipping to well below $14,000 including rebates). Both Canon and Sony offer a Super-35 CMOS image sensor, a PL lens mount, and 4:2:2 1080p30 output over SDI. Some key differences between the Canon C300 and the Sony F3 lie in the codec and media: the C300 records 50Mbps Canon XF to generic Compact Flash cards, while the F3 records 35Mbps Sony XDCAM to proprietary Sony SxS cards. Connectivity is another matter. The F3 offers Dual-Link HD-SDI output, which allows for uncompressed RGB baseband 4:4:4 recording to external devices — that is, when an optional firmware upgrade is added for $4,400, which includes Sony S-LOG gamma, among other things. Meanwhile, the Canon C300 has a single SDI terminal and therefore does not have the option to add Dual-Link SDI or RGB 4:4:4 output… however, Canon’s own LOG gamma is already an included feature in the camera. Other connectivity differences are subtle but interesting; for example, the Sony F3 has an iLink (4-pin FireWire) jack while Canon moved away from FireWire a few years ago. The 8.3 megapixel Super-35 sensor in the C300 is a new CMOS design by Canon. It is not borrowed or re-engineered from the still photography side of the company; instead it has been created “from the ground up” and dedicated specifically to digital cinema applications. The sensor has a resolution of 2,160 pixels tall by 3,840 pixels wide, which qualifies as native 4K. Canon claims that rolling shutter skew is greatly reduced in this sensor relative to current HD-DSLR camera models. Also, each frame can be scanned by the Digic DV III processor more quickly compared to an HD-DSLR, such as the 21 megapixel CMOS sensor in the Canon EOS 5D Mk. 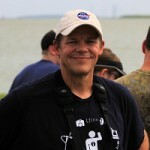 II, which has 2.5 times as many pixels as the C300. Canon says that their Digic DV III processor reads this new sensor differently; it does not use the line-skipping method found in high-res HD-DSLR sensors. Instead, every four pixels (two green, one red, and one blue) are sampled for each final output pixel. In other words, color is assembled the same way as a traditional three-chip sensor block… two megapixels of red, two megapixels of blue and four megapixels of green (twice as much green as red or blue, since green carries the luminance info). Each primary color sampling off of the sensor is native 1920×1080, each color value alone is equal to the final output resolution. Canon claims that the processed signal has 1,000 lines of TV resolution, and the moire, diagonal line stair-stepping and other artifacts are greatly reduced in this chip compared to HD-DSLR cameras. The benefits of using a large Super-35 sized sensor are high resolution output, high image sensitivity in low-light shooting situations and shallow depth of field for fine focus control. It’s very interesting to note the features that are not included in the C300… namely, the complete absence of any automatic controls. Focus and exposure are completely manual; there is no AF or AE mode on the C300 or C300 PL. Nor are there any semi-automatic program modes such Aperture Priority (Av) or Shutter Priority (Tv), commonly found on all Canon camcorders and photo cameras. The C300 is therefore clearly intended almost exclusively for filmmakers and television production, for which the vast majority of shooting situations dictate very fine — and therefore manual — control of focus, exposure, and other image parameters (including white balance — there is no AWB on this camera). That’s perfect for filmmakers, who have long demanded manual control of everything. And it’s perfect for any sort of controlled production, whether it’s for television, or corporate, or some levels of the government and education markets where skilled cinematographers are operating in carefully controlled environments. However, one can’t help but wonder if Canon is painting itself into a corner (although the filmmaking / television production corner certainly has plenty of room) by the intentional exclusion of AF, AE and other automatic controls. After all, there is a very broad range of applications for which the C300 would be completely unsuitable… such as non-repeatable event videography, chief among this field being sports, but also weddings other types of live events as well. You could say that the filmmaking / television production industry is the only market Canon has in mind for this camera. The person or company owning a stable of Canon EF lenses will have to make a decision based on the type of work that they’re doing: will they need autofocus or not? If not, the C300 camera will suffice. 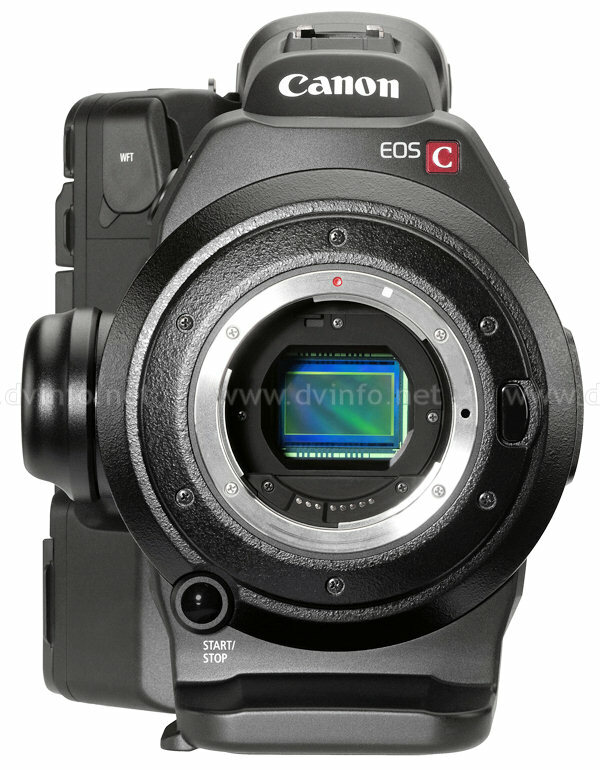 But anyone wanting to use autofocus on a Canon EF or EF-S lens — which is a primary feature of the EF line — will be better served by choosing a RED Digital Cinema DSMC camera equipped with RED’s own DSMC Titanium Canon EOS mount, which fully supports autofocus and other EF lens features. But that’s only the beginning of the C300’s similarity to the other camcorders in the Canon XF series (the XF305/300 and XF105/100). The same BP-955 and BP-975 batteries fit inside the body, and a BP-955 is included in the C300 package, as well as the CA-940 AC power adapter. The C300’s menu system interface is practically identical in fuction and appearance to the one used in all of the other Canon XF series camcorders, and the Custom Preset menu is a close twin as well (although the Custom preset files generated by the C300 are not backward-compatible). There are quite a few assignable buttons on the C300 body, just like the XF305/300. And like the XF305 and XF105, the C300 has SDI, GenLock and TimeCode jacks. An HDMI output jack is present, and there’s even a LANC jack. 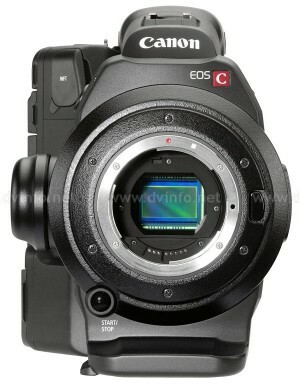 The EVF on the C300 is the same one found on the XF305/300. Compact Flash cards recommended by Canon are the same ones that are approved for the XF series camcorders, and the card recording options are the same, including simultaneous recording to both card slots, thereby generating two identical copies of the video files during shooting. There’s also a continuous relay recording option, and the card slots are hot-swappable during recording. 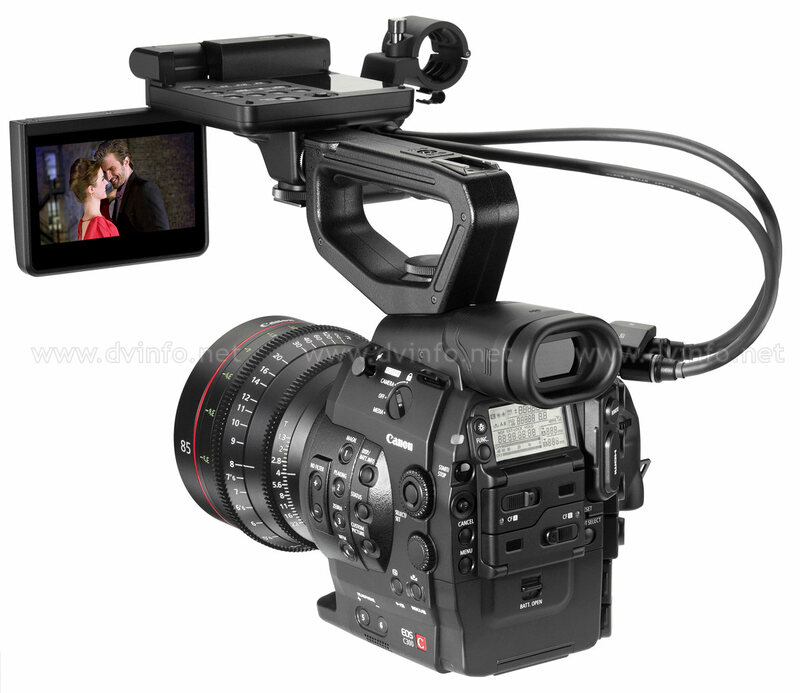 Despite the similarity to the Canon XF series in terms of components and functions, Canon has chosen the EOS brand (or rather, Cinema EOS) for the C300. The two years that were spent in research and development on this camera were lead by a member of Canon USA’s still photography EOS team. In addition to the EF lens mount, another feature borrowed from the EOS side is the weather proofing on the C300… its gaskets and seals make it equal to the EOS 5D Mk. II’s ability to withstand some degree of dust and precipitation. So far, the C300 is the only Canon EOS-branded camera to include a headphone output jack. 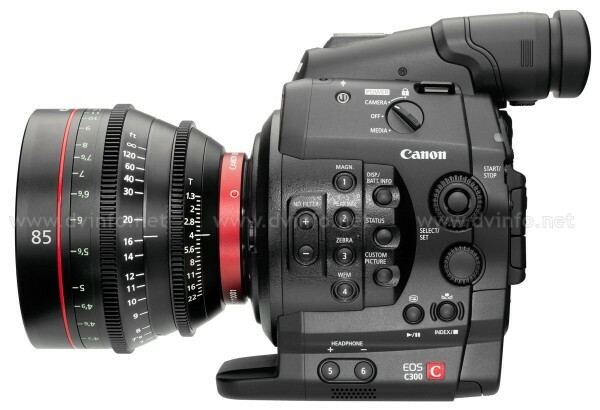 The C300 is touted by Canon to be compact and somewhat modular. The base package (without a lens) contains the camera body with viewfinder, a removeable top handle, a pivoting side grip which can be replaced by a simple thumb rest (included), a battery and an AC power adapter, an EVF cap, a pair of measuring hooks (one for each side of the camera), and an XF Utilities software disc. The kit also includes a monitor unit which can clamp onto the top of the camera. It has a flip-up multi-angle LCD, playback controls and assignable buttons, and a pair of XLR audio input jacks on the side. Of course, the camera can operate without this unit, or for that matter without the side handle grip. 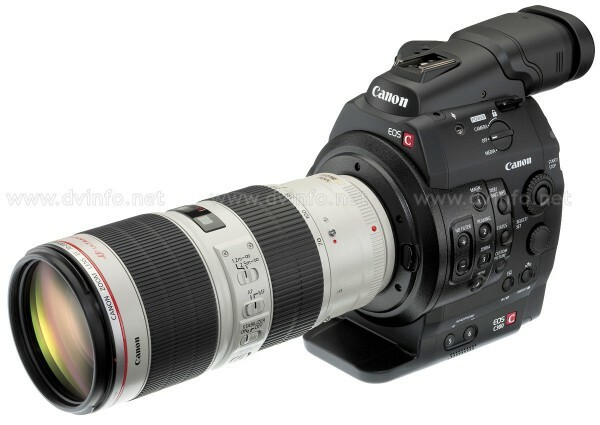 The C300 offers a choice between 23.98 frames per second and 24.00 frames per second, which is something new for Canon. Slow and fast motion recording options, selectable in 1fps increments up to 60fps (in 720p recording mode), are available as well. An intervalometer and a frame recording function are also included. Canon LOG gamma is offered in the image customization menu. Ideal for postproduction color grading, it provides a flat image with subdued contrast and highlights, and a higher dynamic range over the standard color settings. Another color option is EOS Standard, which applies high contrast and vivid colors directly in-camera. Once the image has been set up to match the desired taste, the camera can be switched to “Lock” mode, which disable all menus, buttons and dials except the record triggers (of which there are four). The LANC jack has already been mentioned, but there’s another option for true versatility via remote control, and that’s over a wireless network connection, made possible by adding the WFT-E6 wireless file transmitter, which was recently introduced with the Canon EOS 1DX Digital SLR camera. Focus, iris, and rec / pause may be controlled from a web browser with this unit, from a laptop, tablet computer or smart phone on set. The web interface allows for a range of metadata input. There’s also a camera status display window including timecode readout and major camera settings, plus a live view 476×268 video display monitor. Why not 4K, or Ultra-High Definition? Some folks might find it curious that Canon’s first foray into the D-Cinema camera arena is limited to 1080p output only. Considering that the most prolific digital cinema camera manufacturer in the world (RED Digital Cinema, having sold appx. 8,000 RED One MX cameras, over 1,000 Epic M cameras, and numerous Epic X cameras shipping daily) has been supplying Ultra-High Definition cameras since 2008, it may seem a bit odd for Canon to choose 1080p at the beginning of 2012. A large number of major Hollywood A-List productions (almost too numerous to count, but among them The Social Network and next year’s The Hobbit to name only a couple) have been enjoying the benefits of 4K acquisition. Namely, those advantages are sharper compositing keys for green screening, more effective motion tracking, frame adjustment in post,and better-looking downconversions. Despite — or perhaps because of — RED Digital Cinema’s dominance in 4K aquisition, Canon is claiming that “the industry isn’t quite ready yet” for more than 1080p. Perhaps it depends on which particular segment of the industry: although big-budget Hollywood continues to embrace 4K aquisition at a steadily growing rate, it is a fact that there’s still a large majority of television being shot in 1080 HD. From that point of view, the C300 is indeed ready for a wide variety of shooting scenarios, especially considering its edit-ready codec. Canon is careful to point out that the C300 is just it’s first digital cinema camera. Perhaps another model will follow later on, maybe with a new codec to manage something between 2K to 4K recording?